Walsall Wood Colliery, image believed to be not far from closure, possibly 1950s. From Walsall, a Click in Time/Walsall Local History Centre. Had a great enquiry in this week from Nick Pilley, who’s looking for help with his Walsall Wood family history, particularly that of his Grandfather Alfred Merrick who was a deputy at Walsall Wood Colliery. 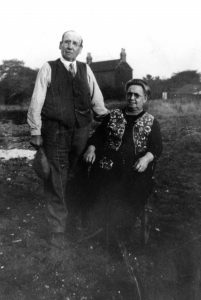 I wonder if you or any of your blog readers are able to help with some research on my Great Grandfather, Alfred Merrick (1866-1936), born in Sutton Cheney, Leics and moved to Shenstone by 1891 and Walsall Wood by 1901. 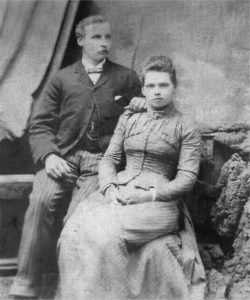 Married Ada Mason (1987-1946) from Hednesford in 1894. Lived initially in New St., then at 9 King St, Walsall Wood which, according to Google maps, has been replaced by flats. Is there a photo around that might show it as it was? His obituary (Walsall Observer, 29 Feb 1936) gives him as a deputy at Coppice Colliery on retirement (1933 approx). The 1911 census says ‘fireman’ and I understand these were fairly interchangeable terms relating to someone who would check for firedamp (and ‘fire’ it) and/or make sure any steam engine air pump was functioning. I generalize but any correction would be appreciated. Also I have seen reference to Coppice linked with Cannock. Was that the same colliery? The obituary refers to his ‘missionary’ work with Holy Trinity Mission in Clayhanger and how he did this in spite of “strong opposition, which frequently went so far as personal violence”. Can anyone explain this opposition? “He was a member of the Hawthorne Lodge of the Independent Order of Oddfellows (Manchester Unity) and in addition to having passed through every chair at his Lodge was a past Provincial Grand Master of the Order. Apart from his Mission interests he had two hobbies, bee keeping and horticulture and in addition to having won many awards he was a long-time lecturer on the subjects for the Staffordshire Education Committee. For several years he rendered valuable service to his workmates as secretary of the Colliery Institute”. Thanks to Nick for an interesting enquiry – can you help? As a side note, as far as I know Walsall Wood Colliery was often called the ‘Coppy’ or ‘Coppice Pit’. That’s not linked to the one in Cannock ‘The Coppice Colliery’ but the term ‘Coppice’ seems to be often used in Colliery names (no idea why) – I’m thinking of Birch Coppice near Dordon, for instance. If you can help Nick or have anything to add, please do yank me on social media, comment here or mail me: BrownhillsBob at Googlemail dot com. Cheers. The name fireman is another name for deputy. Deputy is the person responsible for the safety of the men in the district. According to my mining history book. One of the problems of searching in the Newspaper Archives is that you may come across someone with the same name. The other, of course, is that you may come across some unexpected details. Alfred Merrick who was summoned for not sending his daughter, Martha (13), to school regularly. There are further details, but obviously the daughter’s name would indicate if it was the Alfred concerned. Looking on Ancestry it does not look like Alfred had a daughter Martha. At Walsall Wood Parish Church 21 April 1943, Sergt Sam Davis (RAF) married to Kathleen Merrick, youngest daughter of Mrs and the late Mr. Alfred Merrick of 9, King Street. October 1913 Flower service at HT Clayhanger. The afternoon preacher was Mr A. Merrick of W Wood. Did he have a brother named Fred who was a Lay Reader for the District? “Yew could be right” aritcle, in ths blog, shows the Hawthorne Inn c 1930.. You can just make out the Oddfellows branch lodge shield on the wall near the door. The pub is now called the Drunken Duck..
checking 1891 census……Alfred Merrick living in..Friezland Lane..which is in Walsall Wood..leads to the Coppice colliery, corner of Friezland Lane and Lindon Road… Walsall Wood has been in different census areas over the years…changed as the population grew..
Hello Nick: The Walsall Wood pit was called the Coppy as in Coppice because it was located on piece of land by the name of Paul’s Coppice, hope this is of use to you! Cyril Riley (known as Bob) b.1899. I find this hard to believe. I have not come across any violence towards anyone going about their religious business in these parts. There were of course heated Vestry meetings and words exchanged, but nothing I have found was anywhere near violence. If it were true I believe it would quite a story for the Press. I am inclined to think any personal violence, if there was any, would be connected with his mining activities. In June of 1896 there was a celebration for the Rev T Reakes, Vicar of Walsall Wood, who had served for twenty years, He had amongst other things erected a school and church at Clayhanger, Shelfield and High Heath. These I think would be termed “Mission” churches due to their dependence on the main church at Walsall Wood. At a 1897 Vestry Meeting, elected for the Mission Church at Clayhanger, as acting warden, was Mr. A. Merrick, and he is still mentioned in 1912. There doesn’t seem any mention of a Merrick in association with the Staffs Education Committee meetings, only a £5 plus cost of books for a scholarship of F Merrick (probably son). However there is a sub-committee for agricultural education of which he may have been Secretary. No mention as giving any of the lectures, but of course he may have given talks. The Walsall Wood Colliery Institute opened in August 1900, “for the purpose of affording a means of recreation for the inhabitants of the village.” Sometime around 1903-1906 the word Colliery seems to disappear and it is just referred to as the Walsall Wood Institute. It seems strange to me too. I wondered if there was some kind of temperance/resistance to temperance aspect involved. Of course the mining side is more likely – possibly something to do with the General Strike. As a side issue I have a copy of “Walsall & District Roll of the Great War” in which my grandfather Mason Alfred gets a few sentences about his war service. In fact anyone mentioned gets a few sentences! I don’t have a huge amount of time but would be happy to look up entries for anyone in particular if it helps with other research. I was very kindly allowed to review the Headteacher’s logboobks for Holy Trinity School, Clayhanger in the summer of 2017 – for the whole of the period 1880 to the present new school building being opened. ongoing poor attendance, and a series of epidemics in the times up to the 1930s. Rev Reakes visited the school every week in the first few years . There were catechism examinations, conducted by the good Reverend. Thanks David, I’m glad I wasn’t at school then! I have no idea where the family themselves would have attended or where Alfred would have assisted. Locally, one must assume, but nothing of that detail outside what was in the obituary. Alfred Merrick, being of the established Church, would most likely belong to the Church of England Temperance Society (CETS). This had two distinguishing characteristics. Firstly it consisted of two sections, one for teetotallers and one for those who pledged themselves only to moderation. For that reason the society was uninterested in prohibition, favouring changes to the licensing system. By 1899 CETS was the largest Temperance Society in the UK with over 7000 branches, 100 police court missions and between 150,000 and 200,000 subscribing members. I have a couple of photos of Alfred and Ada. Is there a way to post them directly here? Sep 1902 A miner of Cemetery Rd WW charged with stealing a silver watch value one pound and five shillings belonging to Alfred Merrick of Hall’s Coppice, who is foreman in the WW Colliery. He had hung his coat on a post with watch in one of the pockets. Man had previous convictions and received 14 day’s hard labour. An announcement 24 FEB 1940…In loving memory of a beloved husband and father, Alfred Merrick, who passed away on 21 February 1936, aged 69 years. “Resting where no shadows fall.” Ever remembered by wife and children. (It looks like announcements are made on the aniversary of his death). Can you re-send those please? Hi Bob, no sooner said than done (or I hope so!). The ‘younger’ photo is most likely to be around their wedding, so circa 1894 and the older one is likely to be mid 1930’s and I’m fairly sure it was taken at his allotment so maybe the house in the background is the one in King Street. These are the only photos I have showing Alfred although I do have a couple of others which show Ada in later life. Thank you, I know it seems strange but that’s almost double what I know about Ada.